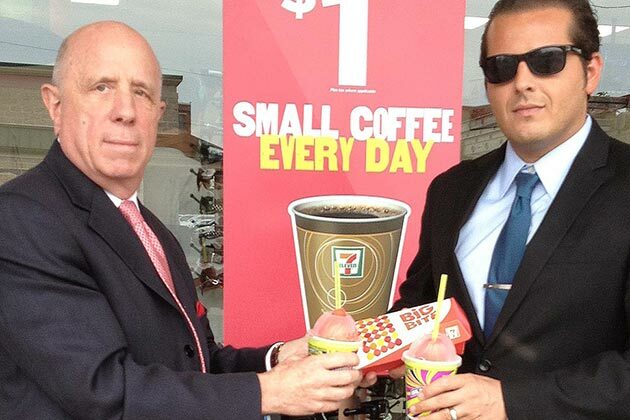 Gerald Marks has spent the past year suing 7-Eleven. The New Jersey lawyer is representing plaintiffs in a dozen lawsuits against the Dallas-based chain, including allegations that 7-Eleven violated labor laws and an antistalking statute and discriminated against immigrant business owners. Marks’s latest action, filed last week in federal district court in New Jersey, seeks back pay for a group of 7-Eleven corporate employees and paints the chain as a bully that uses its heft to push franchisees out of their stores. The company disputes the allegations. In his most extreme accusations, Marks says that 7-Eleven targets South Asian immigrant store owners in profitable markets, looking for contractual breaches to give the 53,000-store chain leverage over its franchisees. If a franchiser can persuade a store owner to walk away from his franchise license, the company can resell the store to another buyer. In legal filings, Marks has alleged that 7-Eleven has made more than $10 million off the strategy. Marks is no stranger to franchise conflicts. His firm, Marks & Klein in Red Bank, N.J., got a $125 million settlement for franchisees in a class action with tool maker Snap-on (SNA), a franchiser, in 2006 and a $206 million settlement for Quiznos franchisees in 2010. Those cases centered on charges that the franchisers used deceptive marketing practices to sell stores to new franchisees. Marks has a trial lawyer’s penchant for theatrics. Sometimes he sounds as if he’s rehearsing a courtroom soliloquy: ”This policy of oppression that 7-Eleven has instituted has, by their own hand, created their own misery,” he says in an interview. The most heated parts of Marks’s campaign against 7-Eleven center on accusations that the company tried to push store owners out of the franchise system. To help make that case, Marks has relied on a statement from Kurt McCord, a former worker in 7-Eleven’s asset protection department with plenty of bad things to say about his ex-employer. In a document filed in federal court in New Jersey, McCord alleged that 7-Eleven kept a “hit list” of franchisees it wanted to oust, focusing on store owners in such profitable markets as Los Angeles and New York as well as those who were outspoken critics of the corporate office. McCord described a negotiation between 7-Eleven and a Riverside (Calif.) store owner whom the chain accused of what amounted to Slurpee fraud: 7-Eleven said the franchisee collected cash for the sugary drinks but entered the transactions as coupon sales, depriving the chain of its share of revenue. Executives of 7-Eleven threatened to sue the store owners in federal court if they left the meeting without signing over their franchise, according to McCord. It was “an almost textbook case of false imprisonment,” McCord said in the statement. The company sued McCord, calling him a disgruntled employee with an axe to grind. In the statement from Pascal, 7-Eleven says McCord sought more than $100,000 cash from the corporation before he “joined forces with the plaintiff’s lawyer.” The company also points to court decisions in Texas, New Jersey, and California it says limit the ways the statement can be used. Marks has kept up a torrent of litigation. In one suit, he alleged that 7-Eleven’s corporate employees are using in-store surveillance tools intended to prevent theft to spy on franchisees. In another lawsuit citing antistalking laws, he said 7-Eleven tailed a store owner named Adnan Khan.